Many of us have emergency supplies that allow us to be self-sufficient for several days after a major disaster; not just earthquakes, but floods, hurricanes, tornadoes, terrorist attacks, you name it. Canned foods have a surprisingly short shelf life: typically 2 years and sometimes 3 years, and of course, what comes out of the can is not necessarily nutritionally balanced. Therefore, MREs (“meals ready to eat”) have become very popular in emergency kits, and I recommend them in my talks. These are military rations also used for emergency relief, and have a number of advantages including multiple nutritionally balanced menus, decent taste and texture, a little food-warming packet, and a really long shelf life…or at least they did until 2010. Surprise! Wait, what? How did all these MREs suddenly get a shorter shelf life, and what does this mean for our emergency kits? I was perusing the Internet for information about MREs that would help me write the article that I initially planned to post this month, and I came across many references on the web to the new guidelines that were just released last year. 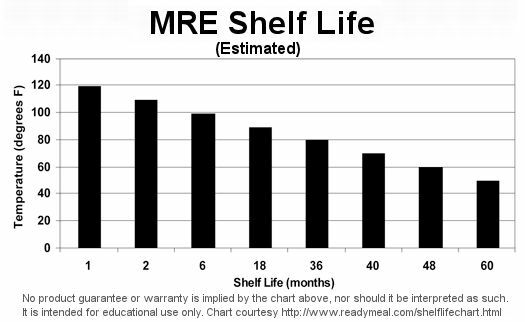 It seems that the chart they’ve been using for years about MRE shelf life at various temperatures was based on tests of the original MRE formulations from the 1980s, at which time they contained a lot of freeze-dried foods. Modern MREs have largely forgone the freeze-dried foods in exchange for sterile-packaged wet dishes, probably under nitrogen or at least vacuum-packed, that still have an excellent shelf life but one that is less than the limits for freeze-dried foods. I’ve included here the pair of pictures that are all over the web, taken from the MRE Info website, which is a site with information about MREs including history, menus, storage, and purchase. 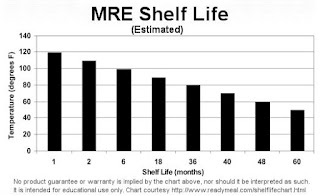 Both show the shelf life increasing as storage temperatures decrease, but the rate is now much faster, to the point that they appear to be saying a typical closet floor temperature of 60-70˚F only gives the MREs a shelf life of 3½-4 years. That’s not very impressive if you ask me, especially considering the cost. However, I suspect that the effective shelf life is really longer than this. Several points are worth noting. Even these websites point out the difference between official recommendations and reality, and refer to personal anecdotal evidence that MREs opened after a decade are still good. Ordinarily, I would not put much stock in personal anecdotal experience, but in this case, I’ll make an exception because I have my OWN personal anecdotal experience. The last time I had my MREs reach their “expiration date” based on storage temperature (7 years in my closet at the time), I tried one, and it was fine. Good enough, in fact, that rather than discard them and waste all that money, I had MREs for dinner for about a week and a half. I also tried one of the new MREs that I got to replace them, and decided, as I say sometimes in my talks, that the new ones were comparable to excellent hospital cafeteria food, and the expired ones were comparable to, well, let’s just say cafeteria food at some of the hospitals that are less culinarily inspired. I also learned, by doing more research at that time, that MREs that have “expired” should still be perfectly fine to eat; they just won’t taste as good and some texture might have suffered. It’s more like a “best by” date than an expiration date. True enough; the beef goes from a nice texture as if you were eating a good quality frozen lunch to more like a canned chili con carne. But it won’t taste terrible, and importantly, will not have become toxic, rancid, etc. The nutritional situation may have deteriorated a bit, but to get you through a few days of self-sufficiency, it shouldn’t be a problem. That is not to say, however, that everything in there will be good. If you check out that MRE Info website mentioned above, there are links to some great tests that they did with two of the more unstable ingredients from some of the menus, the applesauce packet and the cheese spread packet. They stored these things at temperatures ranging from 40˚F to 140˚F (I guess they are thinking about desert storage conditions for the army), and showed photos of what they looked like after different times of storage. Bottom line, applesauce stored at 140˚ for three months looks like Vegemite (in case you don’t know any Australians, picture used motor oil mixed with glue). And indeed, I recall deciding to skip the peanut butter or something like that in one of my old MREs when I was going through my old inventory. Some suppliers are not using the new chart, even though they might sell more of these if they did. For example, SafetyCentral and the Epicenter, as of this writing, are using the old chart. So, it is worthwhile to be aware of these new guidelines, and also to be aware of how they are being set and the somewhat ambiguous nature of the endpoint. My suggestion, based only on what I have heard and experienced, is to plan on a long shelf life but make a note to try one about halfway through and see how it is doing. It shouldn't send you to the hospital, but it you do need to go, be sure to take along a few new MREs in case you don’t like the food! Hi Matt, Can you recommend where to buy MREs? Thank you! With the disclaimer that I'm not promoting any particular suppliers, I have been getting mine online from www.gr8gear.com and www.theepicenter.com. A web search turns up plenty of other suppliers, and I have not compared prices or menus recently. It appears you can even get them on Amazon now. By the way, a terrific site for all kinds of information about MREs is www.mreinfo.com. This comment said "Hi there! Nice stuff, do keep me posted when you post again something like this!" and it was posted by MRE Giant. This comment was not spam, but it contained a live link in the comment text that I couldn't edit out. Live links in comments have caused problems in the past when the overall post is referenced in a new post and that new post gets blocked as spam for any e-mail subscribers; just the unfortunate way the system works. I certainly don't mind MRE Giant being mentioned here since I did mention a couple of other sites in my earlier comment, and their URL is mregiant.com but it will now show up as a non-live link.